As we all know, DC originally wasn't planned to be an unnecessarily drawn out series as it is now. It had a basic storyline and the story progressed fairly quickly in the early chapters, but ever since it got popular and succesful Gosho has done his best to maintain the status quo to (most likely) make more money. Personally I hate it and it's the main reason why DC has lost a big chunk of its importance to me. It used to be one of my favourite series, but now I follow it only very casually and tbh if I wasn't curious about the plot resolution I would've dropped it completely by now. I would've preferred a more dynamic and organic story progression and of course letting the characters age a bit would've been welcome too. I wouldn't have minded a very slow pace (á la Yotsuba&) either, as long as there was some progression. Anyway, what I would like to achieve with this thread is to collect some thoughts about this. My opinion of this issue is mostly negative, but what about you ? Do you like it ? Do you resent it ? And why ? "aim the impossible to reach the possible"
Tsuburaya Mitsuhiko wrote: As we all know, DC originally wasn't planned to be an unnecessarily drawn out series as it is now. It had a basic storyline and the story progressed fairly quickly in the early chapters, but ever since it got popular and succesful Gosho has done his best to maintain the status quo to (most likely) make more money. Personally I hate it and it's the main reason why DC has lost a big chunk of its importance to me. It used to be one of my favourite series, but now I follow it only very casually and tbh if I wasn't curious about the plot resolution I would've dropped it completely by now. I would've preferred a more dynamic and organic story progression and of course letting the characters age a bit would've been welcome too. I wouldn't have minded a very slow pace (á la Yotsuba&) either, as long as there was some progression. Is this because you see no other reason why DC would go on for 22 years? Even with that "most likely" qualifier/condition of yours, that's not exactly a flattering view on Gosho. Name those early chapters. Like many others, did anything post-Vermouth arc, and especially Bourbon arc, lead to this conclusion, as well? Name the file range and year you would've liked to see DC end. Perhaps Gosho's execution is off... repetition would play a role in that. I really doubt it's about making more money on Gosho's part at this point. In fact writing DC means he doesn't have much time to enjoy the money he's made. I don't resent it mostly because I find the plot pretty lame anyway and as long as Gosho delivers good cases and decent character interactions once in a while I'm ok. It's annoying and frustrating sometimes, but tbh it took like 15 years for it to get to that point. How many series only decline at that point? How many go on for that long for that matter? And the anime's the best its been in ages, so I'm pretty cool with the series right now actually! Also tbh, the pacing was only quick for like maybe 3 volumes or so, after that it was mostly character based cases with very minimal plot until Haibara showed up. But I do think that if you care about plot development, Conan is frustrating as hell and not the best series to stay caught up on. My problem is mostly that certain status quos are kept for the sake of the series being less interesting at this point (Ran not knowing Conan's identity being the main one). And it may also depend on how long you've been a fan. I first heard of DC in 2012, and then got into it and joined this forum and DCW in 2014. I became a DC fan in the Rum arc. Hence, I missed the Bourbon arc. Those who had to sit through that arc had an increasing chance of becoming tired/bored/irritated/annoyed with the series, and thinking Gosho will now keep adding more characters like Rei/Tooru whom DC will focus on for years, and Shinichi/Conan will get no closer to finding out the boss and taking down the BO. I started watching in 2008, so I definitely see people's disappointments. Especially that year, well made anime and less filler because 40 episodes of a show in one year is stupid (it is still stupid btw), epic story arc conclusion and immediate start of a new one, one of the best cases ever with Furinkazan. And then literally the next year starts with hilariously disappointing animation and the first signs of Ran's character issues becoming apparent (imo) in a year where the plot barely moves and they used awful, generic music more and more instead of the all time great anime soundtracks. And then 2 years later, reasonable pacing dies forever. And let's be honest, it's much more frustrating to see a series you like have unexpected(?) faults than to see a series you don't care about fail. Welcome to the world of episodic series then. A world where character progression should reset back to zero after the miniarcs end. I don't care about it as long as the characters get fleshed out and the stories are different. I think it would be naive to think Gosho doesn't care about milking the franchise. Many mangaka or creators of fictional work do it, you see it everywhere. Sure it's not flattering or nice to think about, but that's the ugly truth to most of the entertainment business. Not many works are products of artistic expression or genuine interest in producing quality and/or stick to it throughout it's lifetime. The only mangaka I can think of right now that doesn't (seem to) unnecessarily milk his works even though he could is Naoki Urasawa. And yes, I do think there is no other reason for DC to continue for this long and beyond. Gosho even had to stop time within DC, so that he can artifically extend the series' lifetime and rework it into an endless case by case series that can constantly produce merchandise, movies and whatnot to generate money. DCUniverseAficionado wrote: Name the file range and year you would've liked to see DC end. Perhaps Gosho's execution is off... repetition would play a role in that. The length of a series isn't important to me. I don't mind long series. Gosho could've set up a story that would last for 20+ years and introduce new characters left and right as long as there was progression and purpose to it. But he didn't. DCUniverseAficionado wrote: And it may also depend on how long you've been a fan. I'm following DC since 2003, so it's been 13 years. However, there are a lot of other series I've followed for 10+ years, but never got nearly as frustrated as with DC. It's the lack of progression, of milestones that annoys me. Otherwise I'm fine with long or slow paced series. k11chi wrote: Welcome to the world of episodic series then. A world where character progression should reset back to zero after the miniarcs end. Episodic series aren't always like that, though. There are a lot of episodic series that do progress, even if very slowly. DC is a weird hybrid between what you describe and a traditional, story focused manga. It tries to be Doraemon with an overarching story that is supposed to have you engaged, but...yeah, in my eyes it fails horribly. There is so much potential wasted here. A story consists of a set up, several milestones, a climax and a conclusion. DC is stuck in the set up stage for 22 years now. k11chi wrote: I don't care about it as long as the characters get fleshed out and the stories are different. Wakarimashita wrote: I don't resent it mostly because I find the plot pretty lame anyway and as long as Gosho delivers good cases and decent character interactions once in a while I'm ok. I see. Yeah, I think if you're mostly interested in the cases and the usual character antics, then DC isn't that bad, quite good in fact. And I think most DC fans think like you. But I wonder why Gosho doesn't just conclude the story and keep writing single cases after that. He could always establish a new overarching threat, should the fanbase ever get tired of only cases. It's not like time passes in DC. I just can't make sense of him stubbornly clinging to the status quo. Maybe I'm missing something ? kkslider5552000 wrote: But I do think that if you care about plot development, Conan is frustrating as hell and not the best series to stay caught up on. I think you're right. But after spending 13 years into something it's hard to let go, even if I followed the series only casually for the last 4-5 years or so. Tsuburaya Mitsuhiko wrote: Episodic series aren't always like that, though. There are a lot of episodic series that do progress, even if very slowly. DC is a weird hybrid between what you describe and a traditional, story focused manga. It tries to be Doraemon with an overarching story that is supposed to have you engaged, but...yeah, in my eyes it fails horribly. There is so much potential wasted here. A story consists of a set up, several milestones, a climax and a conclusion. DC is stuck in the set up stage for 22 years now. Anyway no it's not. Long running series split these stories into Story Arcs. In DC the build-up phase happens during the cases. That's why we can tell that the Bourbon arc ended and the Rum arc began. The resolution of those arcs is not done in the traditional ways so you might see it as as if it's still building up when it's just fleshing out the plot from the remnants of those arcs that have already ended. 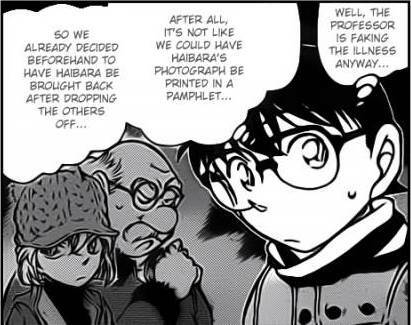 Most of the time everything Gosho writes is impressive to me, I can literally go to google images and write "detective conan panels" and I'm sure it'll be something that takes alot of effort to draw and come up with. Let's see. Just.. Wow. Do I need to say more? This is the type of writing in series I truly do prefer. When the writer takes so many things into account and there are also cases like the fruit casket case with Sera where after all the clues you've given and with common sense, the culprit will be the most logical one. Cases like those ofcourse would get old fast which is why I really like how there are cases like the elementary school case, simple everyday life case, and Kawanakajima where the trick is just ridicilous. I remember reading about how certain cases "fail the show, don't tell 'rule' "... There is no rule like that. Sometimes Gosho manages to play with expectations which goes with the main storyline too. Because that wouldn't be Detective Conan anymore. The premise itself is about solving cases (almost all types you can think of) and coming across hints towards the BO while living with his childhood friend and her father. Why change it to Detective Shinichi solving cases and turn it into another generic detective story? As Waka said, look at his schedule—not as bad as the first couple years of DC (47–49 files per year), but a mangaka's schedule, through and through. The guy even got ill last year. Unless someone knows him well enough to determine whether or not he cares about making money enough (to do whatever he likes to do with it) to work a mangaka's schedule and even get ill, because of it, and puts it out there that he's only doing this kind of work for money, I'm afraid I'll have to disagree on the notion that Gosho Aoyama has a sole stake in DC, now, and that it's money. I'm willing to risk being called naive. Hence why I brought up execution. DC would've reached the point it has now, years ago, had Gosho introduced characters earlier in the series. Heck, he could have, instead of multiple plot threads running parallel and sometimes intersecting throughout an arc, multiple arcs running parallel and sometimes intersecting throughout the overall plot. Because it's not only the cases but also the predicament under which Conan is trapped and the different character interactions it leads to. 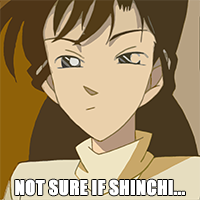 I'm not interested in a Detective Shinichi story, in fact I don't even like Shinichi. I'm loving it. At this point and stage in my life, it's just a fun pastime to do. If I ever felt bored, I just take a break for a couple of months, and marathon back whenever I'm in the mood and there's time. Also, as others have said, it's not about making money. DC is part of Japan's pop culture. As in, it's a front for animanga there, à la Kochikame, Doraemon, Shin-chan, etc. Kind of like Days of our Lives, back when it was still a thing and popular, at least. I'm pretty sure Gosho realizes this, and is just going along with it. I like Eisuke, because the interaction between him and Conan was pretty funny, and indeed I'm missing him. 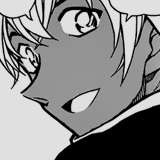 Eri could appear too, but that means that Ran will appear too.. and the episode won't be funny anymore. kkslider5552000 wrote: My problem is mostly that certain status quos are kept for the sake of the series being less interesting at this point (Ran not knowing Conan's identity being the main one). 1. Some would argue that for all the progressiveness he has shown that he's still old fashion in a bad way. Notably that a good civilian (not) girlfriend/wife will wait forever until her man comes home. Even without the arguable sexism it's still a problem in that unlike other shows the story structure means that she shows up more often than she needs to rather than being allowed to be absent until needed. - She was actually allowed to do something like caring for Yusuke's body in the first arc and being the one to help him return, plus taking care of his spirit furby. - There were several points where she didn't appear and rightfully so. 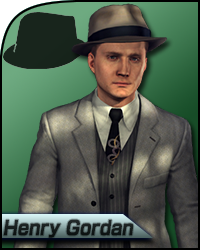 - Namely helping Conan solve cases. - Serving as a means to make it seem like Conan is really a kid. - Sometimes their presence makes it seem like you're in for an average case, when things get interesting like say James Black's intro or The Desperate Revival. - And for the most part (especially in the manga), they're actually allowed to be absent when their presence doesn't help move a story along. 2. 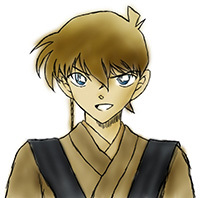 The Mystery of Conan Edogawa fanfic (shameless plug) suggests a possible reason as to why Conan maintains his approach. Namely that while it truly was about protecting Ran at first, it evolved into a thing of pride. To confess his id to Ran now means basically admitting that he's wasted a lot of time and energy trying to keep her in the dark. Who's to say that Gosho isn't keeping the status quo intact to save face and prove that the story can work with her importance being told rather than shown. To budge on it means accepting that he was basically being stubborn. And I say stubborn because letting Ran in on the secret ironically allows for Gosho to have it both ways. Doing so not only doesn't compromise the ability to continue the series for more years, but it provides him with more substantial padding fodder (i.e. character development, addressing troublesome implications whether by design or lacking of understanding how people work and making the endgame pairing more plausibly healthy, loads of irony). Plus it feels like the confession in the London arc was designed somewhat to shake things up or at least to give the illusion of such as this confession can't really pay off until the ending 80 years later.